We actually remembered to harvest some of the edible stuff from the garden. We did pick some herbs last year and froze them but it was at the end of the season and they had mostly died down already. We’ve already left it a bit late this year as the herb garden looks like an explosion and much of it is probably far too mature but hopefully now I’ve hacked it back we’ll get some new growth. Rather than freezing them this year we’re going to try and dry them. Vaguely following instructions from Grown your own month by month I’ve given them a good wash and left them hanging over the sink to drain a bit before moving them somewhere dry to dry out properly. They are probably tied a little too tightly at the moment but just want to get enough water off them that they don’t drip all over the floor. The plan is to pick up some large pickling jars to store the results in once they’ve dried out. 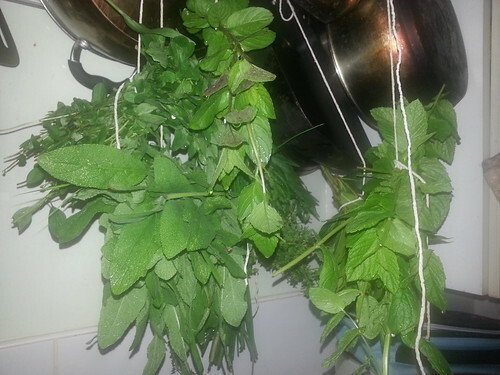 If nothing else the kitchen smells good and my hands are lovely and minty. We’ve also picked our second crop of forced rhubarb, mum got us a Rhubarb forcer for Christmas which is working amazingly.